Home / More / Library / List of Medicinal Plants / Adiantum spp. SIMILARLY USED SPECIES: A. aethiopicum; A. aleuticum; A. capillus-veneris; A. caudatum; A. concinnum; A. flabellatum; A. fragile; A. lunulatum; A. michelii; A. modestum; A. monochlamys; A. nigrum; A. pedatum; A. philippense; A. raddianum; A. radiatum; A. schaffneri; A. tenerum; A. trapeciforme; A. trapeziforme; A. venustum. 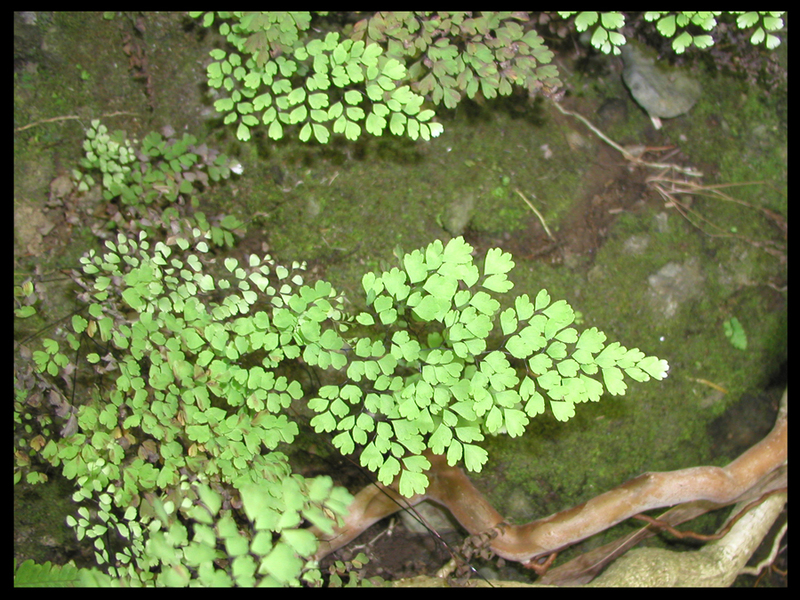 COMMON NAMES: ‘Iwa’iwa [Hawai’i]; maidenhair fern, lady fern [USA]; culantrillo [Amazonia]; culantrillo de piedra [Panama]; avenca [Brazil]. NOMENCLATURE: The genus name is from the Greek “adiantos” (ou = not, and diano = wet), “not wet.” This is a reference to the frond’s ability to repel water. CATEGORY: Cool herbs that transform hot phlegm ~. PROPERTIES: Cool to cold ~. PLANT PART USED: Fronds, leaves and rhizomes. TOXICITY: Although there are no reports of toxicity of Adiantum ferns, many ferns have a substance called thiaminase that can rob the body of B vitamins, so caution is advised. Thiaminase is destroyed by cooking or drying the plant. CAUTIONS AND CONTRAINDICATIONS: Not in pregnancy. Use with caution and monitor blood sugar levels in diabetes. See Possible Drug Interactions below. STATUS IN HAWAI’I: Adiantum capillus-veneris is indigenous. MERIDIAN AFFINITIES: Lung, liver, kidney. WESTERN FUNCTIONS REPORTED: Analgesic (A. jordanii, A. pedatum) [Costanoan, Iroquois]; anti–asthmatic; antibacterial; anticonvulsive (A. pedatum) [Micmac]; antidandruff; antidiarrheal (A. pedatum) [Menominee]; antidote; antifungal; antihemorrhagic (A. pedatum) [Makah]; antihyperglycemic; antimicrobial; antirheumatic – (internal and external) (A. capillus-veneris, A. pedatum) [Cherokee, Iroquois, Mahuna]; antitussive (A. aethiopicum, A. capillus-veneris, A. pedatum) [Egypt, Iraq]; antiviral; astringent (A. capillus-veneris) [Iraq, USA]; demulcent (A. capillus-veneris, A. caudatum, A. pedatum, A. venustum) [India, USA]; depurative (A. capillus-veneris) [Mexico]; diaphoretic (A. capillus-veneris) [Egypt]; diuretic (A. capillus-veneris, A. pedatum, A. philippense) [Egypt, Iraq, Iroquois, USA]; emetic (A. pedatum) [Cherokee, Iroquois]; emmenagogue (A. capillus-veneris, A. concinnum, A. philippense, A. tenerum) [Iraq, Mexico, USA, Venezuela]; emollient (A. capillus-veneris, A. pedatum) [Iraq, USA]; expectorant (A. capillus-veneris, A. caudatum, A. pedatum, A. venustum) [India, Iraq, USA]; febrifuge (A. pedatum) [Cherokee]; galactogogue; laxative (A. capillus-veneris) [Mexico]; pectoral; promotes menstruation [China]; refrigerant (A. monochlamys) [China]; stimulant (A. capillus-veneris, A. pedatum) [Iraq, USA]; sudorific (A. capillus-veneris) [Iraq, USA]; tonic (A. caudatum, A. capillus-veneris, A. pedatum, A. venustum) [India, Iraq, USA]; vermifuge. 1) Clears heat transforms and transforms phlegm~. 3) Resolves damp heat ~. PREPARATION OF MEDICINE: Decocted, infused or used in syrup. DOSAGE: 3 – 10 grams steeped. Hair wash [Europe, Lummi, Makah, Navaho, Skokomish]; balding [Europe, Mexico, Peru]; dandruff [Europe]. Skin problems [China]; eczema [India]. Digestive problems [Costanoan, Makah]; indigestion, “sour stomach” [Amazonia]; heartburn [Amazonia]. Diarrhea [Europe, India, Malaya, Menominee]; dysentery. Used to induce vomiting [Cherokee, Iroquois]. Head and throat inflammation [Egypt, Iraq, Spain, USA]; sore throat [Native American]; hoarseness [USA]. Jaundice [Eclectics, Europe, Peru]; hepatitis [Egypt (A. capillus-veneris)]; liver problems [Iroquois, Mexico], alcoholism. Boils and sores [Hawai’i, India, USA]; fever [Cherokee, China, India, Native American]. Pain [Costanoan, Iroquois]; joint pain (internal and external) [Amazonia, Cherokee, Iroquois, Mahuna]; muscle pain [India]; swelling [Indonesia]. Bleeding from trauma [Makah (leaves chewed and applied topically)]; wounds [India]. Topical for insect bites and stings [Navaho]; snake and spider bite [Egypt, Iroquois]. Smoked or infused for insanity [Navaho]. General menstrual problems [Costanoan, Iroquois, Menominee, Potawatomi, Universal, USA]; abnormal uterine bleeding [Kickapoo-Mexico]; excess menstrual flow [Europe]; menstrual discomfort, late menses [Europe, India, Mexico, Spain, USA]. “Morning-after” tea [Kickapoo – Mexico]. “It helps cure asthma, coughs, and shortness of breath. It is good against jaundice, diarrhea, spitting of blood and the biting of mad dogs. It also provokes urination and menstruation and breaks up stone in the bladder, spleen, and kidneys. – – ‘K’Eogh, 18th century herbalist. General respiratory problems [Brazil, Cherokee, USA]; bronchitis, pertussis, cough with sticky phlegm, excess mucous, coughing blood [Amazonia, Brazil, Egypt, Europe, India, Iraq, Lesotho. Mexico, Native American, Turkey, USA, Venezuela]; pleurisy [Eclectics]. Common cold [Amazonia, China, Egypt, Haiti, Iraq, India, Lesotho, USA]; chills [Native American]; influenza, sore throat [Native American]. Bladder problems [Amazonia, Mexico]; edema [Egypt]. USE AS FOOD: Used as a garnish on sweet dishes (fronds). Also made into thick syrup with sugar and orange water. OTHER USES: Maidenhair stems are used in basket designs in Karok. Adiantone, adiantoxide, astragalin, beta-sitosterol, caffeic acids, caffeylgalactose, caffeylglucose, campesterol, carotenes, carotenoids, coumaric acids, coumarylglucoses, diplopterol, epoxyfilicane, fernadiene, fernene, filicanes, flavonoids, hopanone, hydroxy-adiantone, hydroxy-cinnamic acid, isoadiantone, isoquercetin, kaempferols, lutein, mutatoxanthin, naringin, neoxanthin, nicotiflorin, oleananes, phenylpropanoids, populnin, procyanidin, prodelphinidin, quercetins, querciturone, quinic acid, rhodoxanthin, rutin, shikimic acid, triterpenes, violaxanthin, zeaxanthin. POSSIBLE DRUG INTERACTIONS: One source listed Adiantum as potentiating insulin or diabetes medications but I could not verify this in published studies. Bronchitis, asthma: Add Sonchus oleraceus (pualele). Hepatitis: Add Zingiber officinale (‘awapuhi päkë / ginger). Common cold: Add Pandanus tectorius (hala). Irregular menses, cramps: Add Cyperus rotundus (xiang fu). HABITAT: Likes it wet, cool, an’ shady. GATHERING: Gathered in June in Europe. Hawai’i year round. RESEARCH: An extraction of A. ceneatum is anti-inflammatory in mice and a stronger analgesic than aspirin or acetaminophen [Bresciani 2003]. In France, Maidenhair fern was once made into “syrup de capillaire” and used for lung problems. While going “holoholo” (wandering) up riverbeds one will often come across overhanging walls of delicate ferns, glistening with moisture. If you are fortunate enough to come across a maidenhair leaf that looks a bit larger than the others and has deeper clefts in the leaves, gently turn it over and look at the spore packets (sori) on the underside of the leaf. If they are rectangular rather than kidney shaped, (“boomers” may have to put on their reading glasses to do this) then you are viewing a living relic of Hawai’i’s ancient past: this is a native Hawaiian maidenhair. Bresciani LF, Priebe JP, et al. 2003 Pharmacological and phytochemical evaluation of Adiantum ceneatum growing in Brazil. Z Naturforsch [C]. Mar-Apr;58(3-4):191-4. Palmer, Daniel D. 2003. Hawai’i’s Ferns and Fern Allies. Honolulu: University of Hawai’i Press.